GRAND CANYON, ARIZONA — It is only natural, standing atop Grand Canyon, to gaze into the depths below and wonder if it is possible to hike all the way down to the river and back in a day. Hiking rim-to-river offers ambitious backpackers the ultimate Grand Canyon experience—an extraordinary 'trip through time' that traverses twelve distinct geologic formations. Attempting the entire round trip in a single day, however, is no casual outing. Seen from popular Yavapai Point atop the Canyon's south rim, the blue-green (or red-brown) ribbon of the Colorado River is a tantalizingly-close two horizontal miles away. But the river's apparent proximity is misleading. 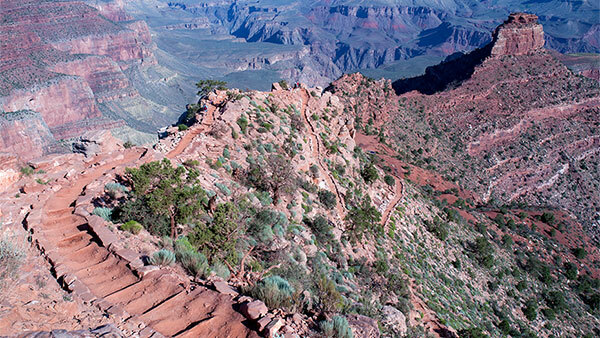 Nearly a vertical mile of climbing lies between the bustle of tourists along the rim and the Colorado below—enough air, perhaps, to make even the least contemplative canyon visitor think twice before attempting to hike all the way down. And then there are the signs: WARNING signs; lots of them, part of an active program to discourage rim-to-river day-hiking, including not just signs but also strategically-placed park rangers who attempt on the busiest days to intercept and turn back potential R2R day hikers. Given the vast numbers of people who hike the canyon without incident each year, your first reaction may well be to wonder if the danger truly warrants such aggressive intervention. But consider this: Grand Canyon park rangers rescue an average 300-500 people per year who hike in and then discover they can't hike back out. The Canyon may well be one of the most perfect terrain traps on the planet. Armed with only a pair of flip-flops and a soda can, your average tourist can easily descend a long way into the Canyon's unique mixture of heat and depth, lured onward by gentle grades plus a never-ending parade of scenic wonders. When said flip-flopper finally does turn around, they are already dangerously dehydrated, exhausted, and overheated, at which point they discover going up is much, much harder than going down. It is a recipe for disaster every bit as brutal as it is effective. The most popular time to visit is summer, and it is here that conditions are the most deadly. But anytime of year, the same basic threat exists: Grand Canyon's ability to overwhelm even experienced hikers cannot easily be put into words. Indeed, veteran hikers and highly-conditioned athletes are perhaps more likely to get into trouble below the rim. And in this at-risk group I'm a perfect match: fit, experienced, ambitious. My experience is telling me that attempting a summer rim-to-river day hike is madness, but the truth is I don't always take my own advice. I know I can get all the way down to the river—but can I get back up? It is a chilly August morning atop the South Rim of the Grand Canyon. I'm here, and I'm about to find out.